This story is part of a special Inlander Cat Friday series, Inland Northwest Business Cats, profiling cats who hang out or live at local businesses. Read the previous post here. 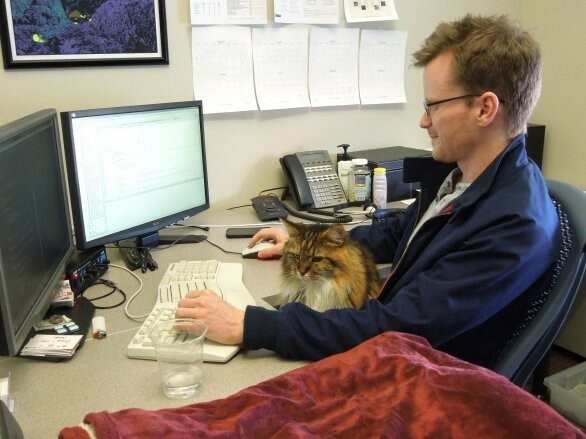 Several chains of events occurred before Maddie the cat became the sort-of official feline mascot for downtown Spokane web and graphic design firm Design Spike. Later I learn, thankfully, that Maddie seems to like everyone she meets, so my fears remain unfounded. A friend of Hall’s who works at a Seattle vet clinic contacted him last October when one of the clinic’s clients brought Maddie in with the request to re-home the cat since her owner wasn’t able to care for her any longer. Maddie is 14 years old. In human years, that averages out at the ripe age of 72. Looking at Maddie, though, it’s hard to peg her as a senior kitty. When Hall received the news of Maddie’s plight, he drove over to Seattle to pick up the newly homeless senior cat. The lucky feline now comes to work with him on an occasional basis, and even enjoys sitting in on meetings, he tells me. In fact, Maddie really seems to enjoy being at work with Hall, he says. She wanders from desk to desk in the small, four-person firm’s office on the second floor of the Liberty Building, overlooking Washington Street. During our interview, Maddie wandered off to explore the office’s copy machine/storage room. After Hall coaxed her to come out from behind some boxes on the floor, she moseyed back to his office and reassumed her observing perch on his desk. Having a cozy blanket on the desk for Maddie to doze on helps, though, Hall says. Sometimes she prefers his lap to the blanket. Now that Maddie has become accustomed to coming into the office with Hall, who works long, 10-hour days, he brings her in on occasion so she’s not lonely at home. “She has people to interact with here, and she’s not home by herself,” he says. What cat wouldn’t like that? Coming to work with its human on a semi-regular basis and hanging out in a sunny, bright office with large window sills to sit in and watch the world go by, and a complete set up of food, water, litter box and bed right there? 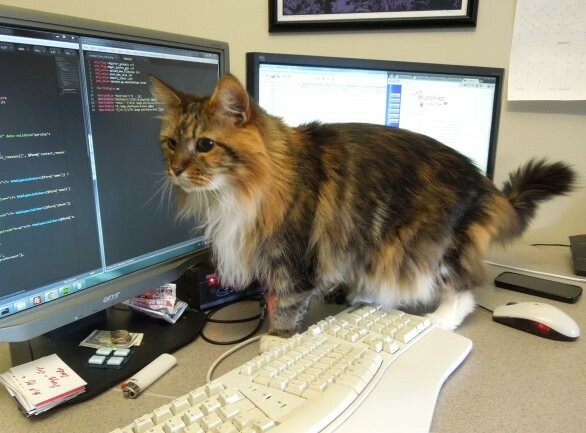 At Cat Friday/Inlander HQ, we’ve long been proponents of the positive influence office pets (cats) can have on productivity. 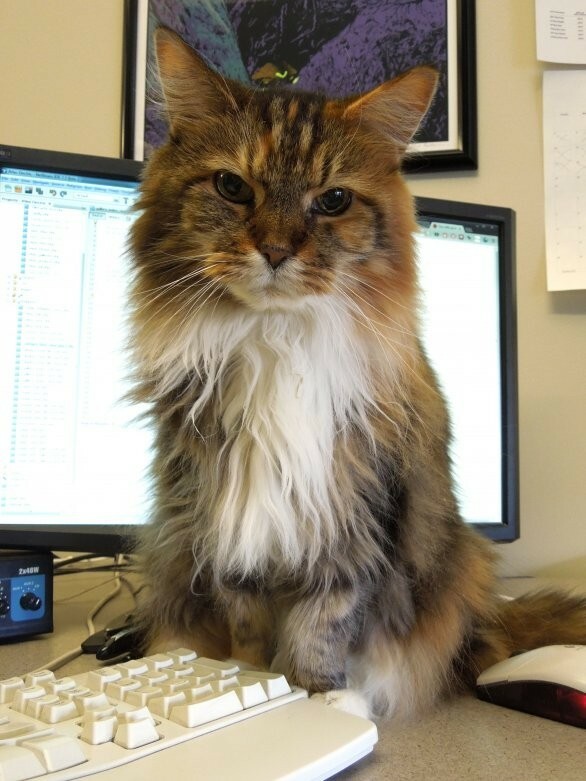 Tell us of any local Inland Northwest businesses you know of that have a part- or full-time resident feline and we’ll consider them for a future profile for our "Business Cats of the Inland Northwest" series! Email suggestions to CheyS@Inlander.com. Zoey, Aiden and Zelda help with inventory and posting photos of items for sale to the business's Facebook page.